A team of University of Toronto chemists has created a battery that stores energy in a biologically derived unit, paving the way for cheaper consumer electronics that are easier on the environment. The battery is similar to many commercially-available high-energy lithium-ion batteries with one important difference. It uses flavin from vitamin B2 as the cathode: the part that stores the electricity that is released when connected to a device. 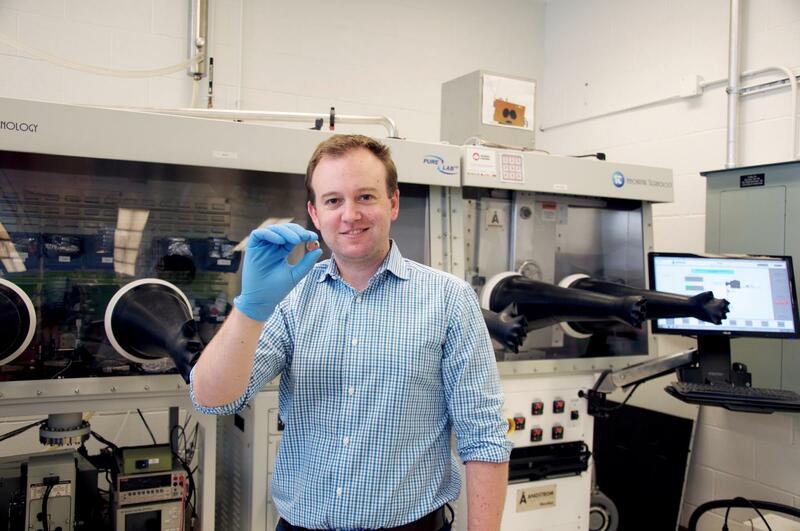 "We've been looking to nature for a while to find complex molecules for use in a number of consumer electronics applications," says Dwight Seferos, an associate professor in U of T's Department of Chemistry and Canada Research Chair in Polymer Nanotechnology. "When you take something made by nature that is already complex, you end up spending less time making new material," says Seferos. When a battery is connected to a phone, iPod, camera or other device that requires power, electrons flow from the anode - the negatively charged electrode of the device supplying current - out to the device, then into the cathode and ions migrate through the electrolyte solution to balance the charge. When connected to a charger, this process happens in reverse. The reaction in the anode creates electrons and the reaction in the cathode absorbs them when discharging. The net product is electricity. The battery will continue to produce electricity until one or both of the electrodes run out of the substance necessary for the reactions to occur. While bio-derived battery parts have been created previously, this is the first one that uses bio-derived polymers - long-chain molecules - for one of the electrodes, essentially allowing battery energy to be stored in a vitamin-created plastic, instead of costlier, harder to process, and more environmentally-harmful metals such as cobalt. "Getting the right material evolved over time and definitely took some test reactions," says paper co-author and doctoral student Tyler Schon. "In a lot of ways, it looked like this could have failed. It definitely took a lot of perseverance." Schon, Seferos and colleagues happened upon the material while testing a variety of long-chain polymers - specifically pendant group polymers: the molecules attached to a 'backbone' chain of a long molecule. "Organic chemistry is kind of like Lego," he says. "You put things together in a certain order, but some things that look like they'll fit together on paper don't in reality. We tried a few approaches and the fifth one worked," says Seferos. The team created the material from vitamin B2 that originates in genetically-modified fungi using a semi-synthetic process to prepare the polymer by linking two flavin units to a long-chain molecule backbone. This allows for a green battery with high capacity and high voltage - something increasingly important as the 'Internet of Things' continues to link us together more and more through our battery-powered portable devices. "It's a pretty safe, natural compound," Seferos adds. "If you wanted to, you could actually eat the source material it comes from." B2's ability to be reduced and oxidized makes its well-suited for a lithium ion battery. "B2 can accept up to two electrons at a time," says Seferos. "This makes it easy to take multiple charges and have a high capacity compared to a lot of other available molecules." "It's been a lot of trial-and-error," says Schon. "Now we're looking to design new variants that can be recharged again and again." While the current prototype is on the scale of a hearing aid battery, the team hopes their breakthrough could lay the groundwork for powerful, thin, flexible, and even transparent metal-free batteries that could support the next wave of consumer electronics.